If you'd like to learn how to manage data risk and the strategies for monetizing data, then you'll want to attend the O'Reilly Security Conference happening in New York Oct 31-Nov 2, 2016 and in Amsterdam Nov 9-11, 2016. Below you'll find the full report "Not all data is created equal," by Gregory Fell and Mike Barlow. A downloadable edition of the report is available here. When you’re driving through a blizzard, all the snow on your windshield looks the same. If you were to stop and examine the individual snowflakes more closely, you would discover an astonishing variety of shapes and formations. While linguists and anthropologists bicker over how many words the Eskimos really have for snow, the simple truth is that there are many different kinds of snow. Like snow, data comes in a wide variety. There’s personal data, demographic data, geographic data, behavioral data, transactional data, military data, and medical data. There’s historical data and real-time data. There’s structured data and unstructured data. It often seems as if we are surrounded by rising mountains of data. The big difference between snow and data is that unless you own a ski resort, snow isn’t perceived as economically valuable. Data, on the other hand, is increasingly seen as a source of power and wealth. If you live in a region where winter snowstorms are common, then your town probably has a fleet of snowplows and a snow emergency plan. Very few companies, however, have developed comprehensive policies and robust practices for categorizing and prioritizing their data. “The main challenge in creating policies and practices for managing data effectively is the limited ability of most businesses to identify data assets and categorize them in terms of criticality and value,” says Chris Moschovitis, an IT governance expert and chief executive officer at tmg-emedia, an independent technology consulting company. Most organizations lack the skills and experience required for identifying and valuing data assets. “The task of asset identification alone can render even the most well-meaning employees helpless,” says Moschovitis. As a result, many companies find themselves wrestling with thousands of “orphan assets,” which are assets that have no clearly identified business owner. That’s like owning a warehouse full of items, but not knowing how many or what kind of items are in it. “Data is a business asset, which means it’s owned by the business and the business is responsible for managing it. Business owners should perform regular audits of their data so they have a good grasp of what they own and understand its current value,” he says. The failure to audit and categorize data can be harmful to a company’s health. “The downside is significant,” says Moschovitis. In most companies, for example, low-value data far outnumbers mid-value and high-value data. Spending the same amount of money protecting all kinds of data, regardless of its value, can be financially crippling. Most companies find it difficult to assess the current value of their data assets. Different companies place different values on similar assets. Additionally, the value of data changes over time. Data that was highly valuable two years ago might have depreciated in value—or its value might have risen. In either case, the level of control should be adjusted accordingly. “In the worst case, underprotecting critical data leaves it exposed. If that critical data is lost or compromised, the company may be out of business,” says Moschovitis. Monica Rogati is an independent data science advisor and an equity partner at the Data Collective, a venture capital fund that invests in big data startups. Ideally, she says, companies should develop data acquisition strategies. “You want to capture all the signals contributing to the process of understanding your customer, adapting to changes in markets and building new products,” Rogati explains. For many digital companies, the challenge is imagining the world beyond the edges of their apps. “Let’s say you make food and deliver it. Your customers use your app to order the food. You capture the data about the order. But what about other data, like the items the customer looked at but didn’t order? It’s also important to capture data about the choices and the pricing, in addition to seeing what the customer finally ordered. It’s important to know how people are reviewing your food and what they’re saying about it on Twitter. Or if they’re emailing you,” says Rogati. Weather data, for example, can be extremely useful for many kinds of businesses, since most people are heavily influenced by the weather. “You should also be looking at commodity prices, census data, and demographic data,” says Rogati. If you’re in the food or restaurant business, you need to know the competitive landscape. Do you have many competitors nearby, or only a few? “There’s a lot of emphasis on coming up with great algorithms, but the data itself is often more important. I’m a big fan of keeping the algorithm simple and thinking creatively about the quality and variety of signals you’re pulling in,” she says. Rogati believes we’re on the verge of a paradigm shift in which “digital natives” are superseded by “data natives.” If she’s right, organizations will have to significantly ramp up their data management skills. “Digital natives are people who are comfortable with computers and who cannot imagine a world without the Internet,” she says. Data natives, on the other hand, are people who expect the digital world to adapt to their preferences. They’re not satisfied with smart devices. They want apps and devices that continuously adapt and evolve to keep up with their behaviors. “They’re thinking, ‘Why do I have to press the same 10 buttons on the coffee machine every morning? Why can’t it remember how I like my coffee?’ They’re thinking, ‘Why doesn’t the GPS remember my favorite way to get somewhere?’ They expect their apps and devices to be capable of learning,” says Rogati. The self-learning machines of tomorrow will require lots more data than today’s smart devices. That’s why forward-looking companies need formal data acquisition strategies—merely trying to guess which data will be important or valuable won’t be enough to stay competitive. Moreover, some of the most profitable decisions are often made by combining data in novel or unexpected ways. Retailers combine econometric data with weather data to predict seasonal demand. Oil producers combine geological data with political data to predict the cost of drilling new wells. Banks combine data on interest rates with data on personal income to predict how many people will refinance their homes. Creative combinations of ordinary data can spawn entirely new universes of unknown risks and unexpected consequences. Combining two or three pieces of seemingly innocuous data creates second-order constructs that can easily serve as proxies for race, gender, sexual preference, political affiliation, substance abuse, or criminal behavior. Data that might be harmless in isolation can become dangerous when mixed with other data. Laws, rules, and guidelines devised to prevent discrimination will be circumvented—intentionally or accidentally—as organizations use increasingly sophisticated analytics to carve out competitive advantages in a global economy fueled by data. Remaining anonymous will become virtually impossible. It’s become relatively easy to unmask the identities of anonymous sources, as demonstrated nearly a decade ago when Arvind Narayanan (then a doctoral candidate at the University of Texas at Austin) and his advisor, Vitaly Shmatikov, developed techniques for finding the identities of anonymous Netflix users. Latanya Sweeney, professor of government and technology at Harvard University and former chief technology officer at the U.S. Federal Trade Commission, has shown that 87 percent of the US population can be personally identified by using their date of birth, gender, and zip code. In The Algorithmic Foundations of Differential Privacy, Cynthia Dwork and Aaron Roth write that “data cannot be fully anonymized and remain useful ... the richer the data, the more interesting and more useful it is.” That richness, however, invariably provides clues that can be exploited to uncloak hidden identities. For example, when Professor Sweeney was a graduate student at MIT, she used anonymized public data to identify the medical records of the Massachusetts governor. As a result, medical privacy rules were tightened, but the underlying principles of information science remain unchanged. In some instances, the best course might be publishing some of the data, but not all of it. In some situations, it’s possible to sanitize parts of the dataset before publishing results. Researchers might choose to keep some of their data secret, while allowing other researchers to pose simple queries that won’t reveal the identities of their subjects. “Maybe you would provide answers to queries from authorized people. Or maybe it’s something more nuanced, like adding noise to the answers for some types of queries and only answering a limited number of queries,” she says. The idea of intentionally adding noise to potentially sensitive data isn’t entirely new. We’ve all seen intentionally blurred faces on videos. There’s even an urban legend about the US Air Force “spoofing” GPS signals to confuse opponents during combat. For example, it makes sense for the Metropolitan Transportation Authority (MTA), North America’s largest transportation network, to collect ridership data. But does the MTA, which serves a population of 15.2 million people in a 5,000–square-mile area including New York City, Long Island, southeastern New York State, and Connecticut, really need to know which subway station you use to get to work every day? You could argue that it’s important for the MTA to track ridership at each of its 422 subway stations, but the MetroCard you use to get through the turnstile is also a handy device for collecting all kinds of data. Instead of simply vacuuming up as much data as possible in hopes that some of it will prove useful, it would be better for organizations to collect the minimum amount of data necessary to achieve specific goals, says Malkin. As mentioned earlier in this report, combinations of data are more potentially dangerous than data in isolation. In the near future, it might seem quaint to even think of data in isolation. All data will be connected and related to other data. We won’t just have data lakes—we’ll have data oceans. In that version of the future, the data we collect will be less important than the algorithms we use to analyze and process it. Even if an organization’s rules and policies expressly forbid using data to discriminate against people, the algorithms they use could be discriminating, either accidentally or unintentionally. “That’s why companies need to be responsible for looking at the algorithms they’re using and making sure the algorithms aren’t discriminating against individuals or groups of people,” says Roxana Geambasu, an assistant professor of computer science at Columbia University whose research spans broad areas of computer systems, including distributed systems, security and privacy, operating systems, databases, and applications of cryptography and machine learning to systems. Geambasu and colleagues from Columbia, Cornell, and École Polytechnique Fédérale de Lausanne have developed a program called FairTest that enables companies to test their algorithms for nondiscrimination. She believes that similar tools will become more common as more people become aware of the potential for accidental discrimination by seemingly “innocent” algorithms. When you consider that many of today’s products are built from data and that it’s relatively inexpensive to store data, it seems wasteful to just throw it away. That said, it’s hard to tell how much data is too much, and how much is too little. You can’t operate software without data—it would be like trying to drive a car with no gasoline in the tank. Skomoroch believes that companies “are being shortsighted” when they discard data that doesn’t seem immediately useful. For example, some companies have arbitrary rules about how long they keep emails. In a system that’s used mostly for transactions, it probably makes sense to automatically delete emails after a certain period of time. But those same emails might contain information that could be mined to reveal customer preferences or uncover reliability issues with products. Deleting the emails would effectively destroy valuable information that could be used to help the company improve its offerings. The lesson here is that since it’s often hard to determine which data will prove valuable, it doesn’t make sense to toss it in the garbage because it has no immediate use or because it might overload a particular system. Which data should be stored and for how long? Which data needs the most protection and which needs the least? Which data is most valuable to the company today? Which data will be most valuable in the future? The chief data officer would also weigh in on a basic question that every company should ask before deciding whether to keep or delete data: is this decision in the best interests of our customers? But who determines the “intrinsic value” of data? Most companies don’t have chief data officers. Most companies don’t have formal rules for categorizing data. Unless they compete in tightly regulated industries such as healthcare and financial services, most companies have weak or immature policies for dealing with data. The authors’ basic premise is that once you have an idea of how you will be using your data, it will be easier to organize and manage it. It’s hard to argue with their logic, and the list provides a good starting point for getting a handle on your data. 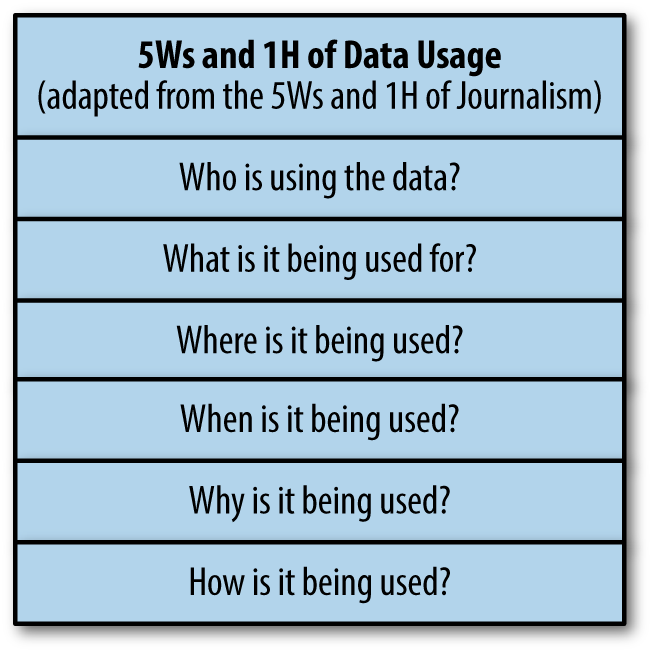 It’s also important to know the “5Ws and 1H” of data usage, since different users will perceive the value of data differently, depending on who is using it, what it’s being used for, as well as where, when, why, and how it’s being used. Many large companies now employ a chief information security officer (CISO) to manage data risks and oversee data security. One of the first questions every CISO needs to ask is: which data needs the most protection? The CISO also needs to know the business value of the company’s data. The value of data depends on many variables, including accuracy, age, and source. If the data is related to a secret formula that creates an important competitive advantage for the company, it will have more value than data that’s related to the company’s organization chart. Knowing the value of data allows the CISO to allocate the appropriate level of protection. The “golden rule” of corporate data security is simple: don’t spend more than the data is worth to protect it. Data is an asset and companies are expected to manage their data responsibly. If a certain piece of data is valued at $1,000, then spending less than $1,000 to protect it is okay and spending more than $1,000 is not okay. That’s why the CISO needs to know the value of the company’s data. The degree of secrecy required for the data. A list of your customers’ zip codes, for example, would be considered less confidential than a list of their Social Security numbers. The degree of consistency and accuracy of the data. Your company’s sales data, for example, needs to be accurate so the sales execs know precisely how many more deals they need to close to meet their goals. The level of uptime or reliability required for systems or applications that are storing or processing the data. If the data is critical to the business, its level of availability needs to be high. For example, if the data is required for your ecommerce site, downtime would result in lost sales revenue. Setting up the C-I-A matrices and assigning values to the three attributes is Step 1. Step 2 is calculating the downside/risk—in other words, how much will it cost if the data is lost or compromised? What are the odds that the site will crash? If the site crashes, what’s the impact on the company? If the website generates $100 million in business for your company and it costs $500,000 to back it up, then the answer is easy: spend the money to back up the system. But if the risk of a crash is very low and the website generates only a small portion of your company’s annual sales revenue, then maybe it makes more sense to invest your money in something else. Here’s a mathematical way of reaching the same decision: multiply the dollar value at risk by the probability of something bad happening. For the website, the value at risk is $100 million and the risk of a crash is probably in the neighborhood of .5 percent. Here’s the math: 100 million × .005 = $500,000. Is it worth spending $500,000 to insure the company against a potential loss of $100 million? We would say yes, but with a qualification. Even if the site crashes, the likelihood of it remaining down for more than a few hours is very low. So you need to really drill down into the sales data and see how much money the website generates on an hourly basis, and during which hours of the day. A crash at 11 a.m. during a regular weekday will result in more lost sales revenue than a crash at 3 a.m. on a weekend. The deeper you drill down into the data, the more likely you are to make a good decision. It takes a certain amount of discipline to do the math, but it’s better than relying on pure guesswork. Toby J.F. Bishop is an independent anti-fraud strategy advisor and former director of the Deloitte Forensic Center. He is coauthor of Corporate Resiliency: Managing the Growing Risk of Fraud and Corruption (Wiley, 2009) and a related article, “Mapping Your Fraud Risks”, which appeared in Harvard Business Review. The quadrant grid approach creates a map that can be grasped easily and intuitively. Generally speaking, you would probably want to keep data in the top-left quadrant (high rewards, low risk) and jettison data in the lower-right quadrant (low rewards, high risk). For data in the upper-right quadrant (high reward, high risk), you would probably want to explore adding strong controls to mitigate or reduce risk. And for data in the lower-left quadrant (low reward, low risk), you might explore ways of improving profitability or reducing costs, which would nudge the value of the data closer to the top-left quadrant. Imagine, for example, a large financial services firm with thousands of dormant credit accounts. From a risk perspective, it makes sense for the firm to close down the accounts and delete the customer data associated with them, since they are easy targets for fraudsters who obtain information from call center employees with access to the account data. But historically, a certain number of those accounts are reactivated by their legitimate holders, and the reactivated accounts generate profits for the firm. “The accounts are highly vulnerable to fraud, but you want to hang onto them because they also represent potential sources of profit,” says Bishop. Rather than closing the accounts and deleting the customer data, the firm could set up a special group to handle the dormant accounts. Access to data about the dormant accounts would be limited to members of the special group, reducing the risk of identity theft or other misuse of the data by call center employees. From a risk/reward perspective, the customer data has been shifted from the lower-right quadrant to the lower-left quadrant. The firm’s decision makers can tell at a glance that the dormant account data poses a low risk. Although the potential rewards are moderate, they would be considered worthwhile since the level of risk has been lowered. In many instances, it’s hard to accurately predict the risk of storing data. For example, it was common practice for industrial companies to store old shipping documents for decades. In some cases, those documents were used by the US Environmental Protection Agency to identify companies as “Potentially Responsible Parties” (PRPs) with substantial liability for Superfund cleanup costs. In hindsight, it would have made more sense—and been perfectly legal—for the companies to have discarded the data after a certain period of time. Several years ago, industry analysts compared big data to oil. Like oil, big data would fuel an economic revolution and transform the world. In retrospect, it seems clear that treating data as some kind of commodity is misguided and dangerous. Data isn’t oil—it’s us. It’s our lives, our behaviors, and our habits. It’s where we go, what we eat, where we live, how much money we earn, which people we like, and which people we don’t like. We can’t treat data like oil because data is infinitely more precious. A better understanding of data starts by accepting that data, like snow, comes in a variety of forms. And for better or worse, it’s not all created equal. Article image: Data landscape (source: O'Reilly).